Corporate Reputation Review was created to provide a forum for research and analysis about reputations and reputation management for companies, as well as social organizations and entities as diverse as non-profit groups, cities, regions, and countries whose reputations have similar epistemological roots. The journal explores relationships between corporate reputation and strategic positioning: corporate identity, communications, and image; branding and profiling; valuation and performance. The contents include quantitative, qualitative, experimental, and field studies with direct application to business practice. 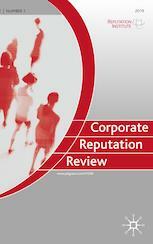 Launched in 1997, Corporate Reputation Review addresses key questions of how corporate reputation impacts on a company’s performance and its value; how corporate reputation can be measured; and how it can be managed. As the leading international journal for scholars and academics, students and business professionals interested in learning about the ‘reputation’ construct and its application to real world institution, Corporate Reputation Review connects research and practice in reputation management. Corporate Reputation Review addresses a broad audience that consists mainly of research and academics in universities and business schools. CRR is also of interest to senior professionals in the private and public sectors. These include C-suite officers in large organizations, concerned in particular with corporate branding, marketing, and communication, stakeholder relations, public relations, and public affairs.